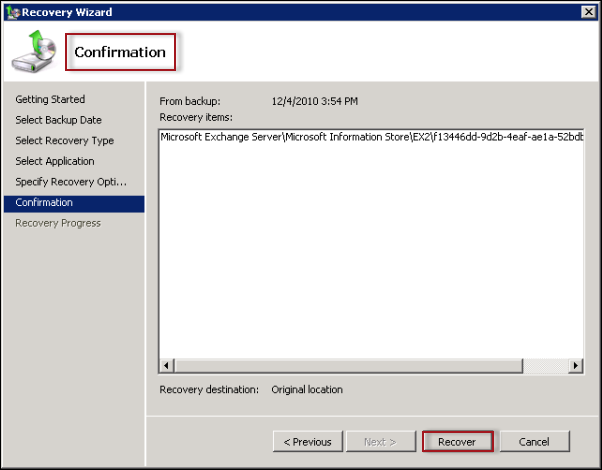 How To Restore Exchange 2010 Mailbox From Backup? SysTools » Updates » Exchange Server » How To Restore Exchange 2010 Mailbox From Backup? In Previous article, we discuss, how we can Restore Deleted Mailbox In Exchange 2013 , now we discuss how Exchange Administrators always keep a track on the Exchange Server activities. Even after they encounter some terrifying circumstances when the disk system where Exchange system resides goes crazy and damages the database. This condition can be managed just by restoring mailbox from Exchange backup. Hence, in this post, we will demonstrate how to restore Exchange Mailbox from Backup in 2013 / 2010 / 2007 environment using WSB. Exchange comprises a plug-in for Windows Server Backup (WSB), which enable users to create and restore Volume Shadow Copy Service (VSS)-based backups of the Exchange data. Windows Server Backup utility can be used to move back mailboxes into Exchange Environment. To use this feature, first, we have to enable this feature using the Powershell. Assigned permissions are required before performing this operation. In order, to check the required permissions, see the “Mailbox recovery” entry. Windows Server Backup must be installed on the local computer. While restoring an Exchange server with the help of WSB role, the administrator must check that the backup is Exchange-aware VSS-based backup as it is important to minimize the problems that may occur while restoring the backup. This Exchange-aware backup can only be generated by using the plugin WSBExchange, which does not support remote backup. 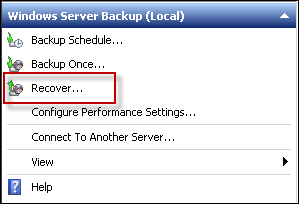 Launch Windows Server Backup (WSB). 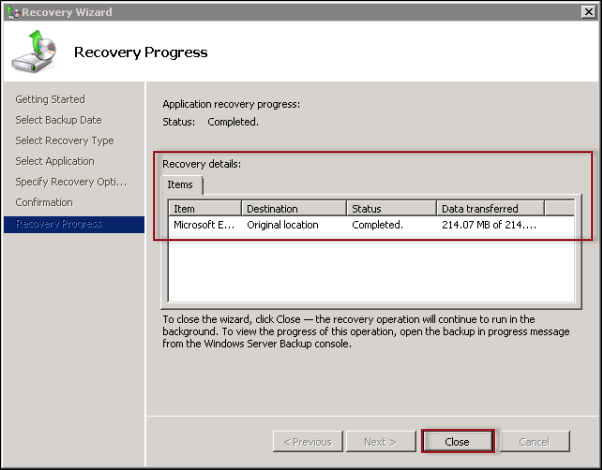 Now, on the Actions pane, expand the Local Backup option and select “Recover…” option. Getting Started page will display now. Here, select This server if your backup file is saved on the local drive. Otherwise, select A backup stored on another location if the file is stored somewhere else. If you are choosing the second option then, the administrator needs to specify the UNC Location where the backup files are located. Note: Make sure that the backup file is Exchange-aware, which means this file should be the result of back up operation that runs locally on Exchange Server via WSB with WSBExchange plugin. In case, if it is not an Exchange-aware backup then, Exchange will not display it on the list of application to recover in further steps. 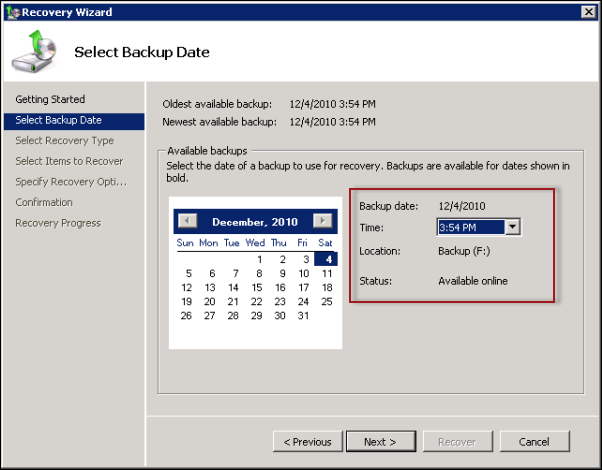 Next, on the Select Backup Date Wizard, the oldest, as well as the newest available date of backup, will be displayed. Set a Backup Date and Time on the Calendar to restore the data of a particular time period from Exchange backup. 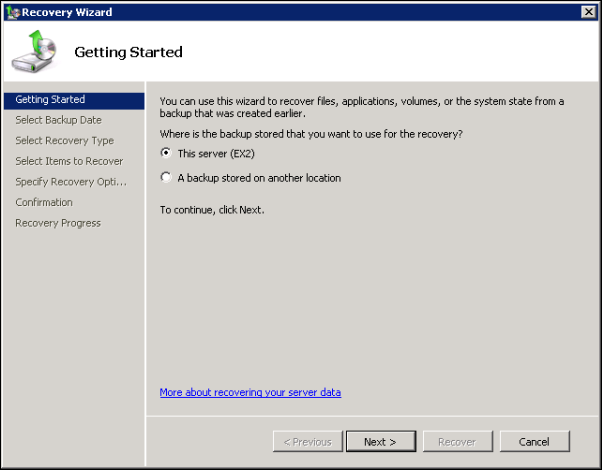 In “Select Recovery Type” wizard, select Applications option. 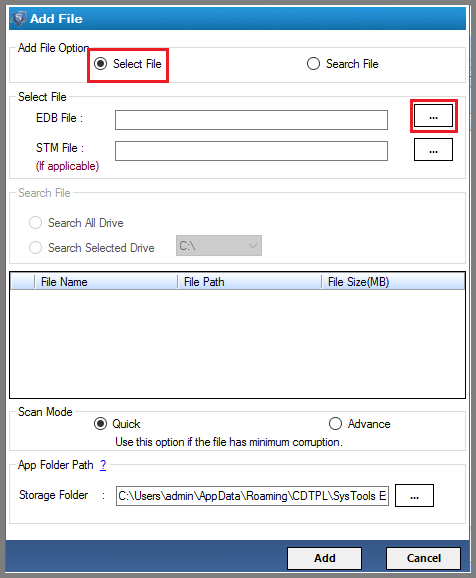 ANNOTATION: If you cannot select the Applications option or it is grayed out then, it implies that the backup was taken at the folder level instead of volume level. Hence, keep in mind that to restore mailbox from backup Exchange with WSB, the backup process must be performed at the volume level. The “Select Application” window will pop up, select Exchange. 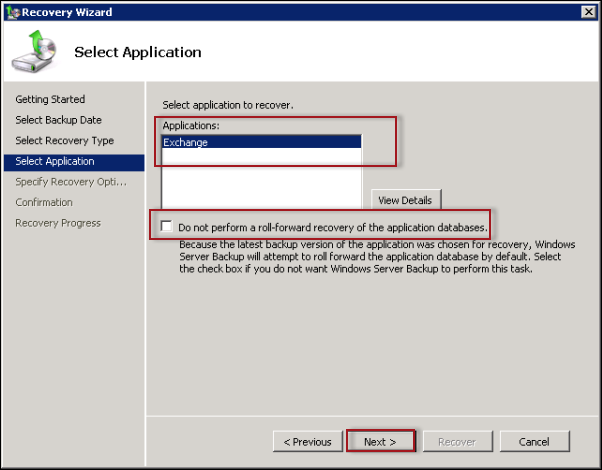 The administrator also can select “Do not perform a roll-forward recovery of the application database” option if the transaction logs from the last backup are not present anymore on the server. In such case, WSB will pull all uncommitted transaction logs. 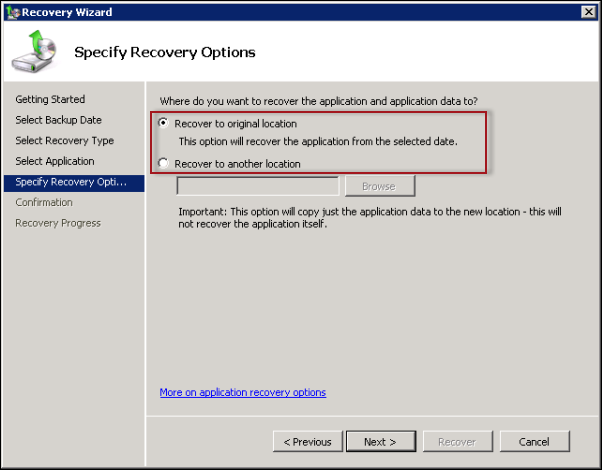 In Specify Recovery Options, choose to “Recover to the Original Location” or “Recover to another location” to restore mailbox from backup Exchange 2010 / 2013 environment. A verification page will come out to review the actions, hit the Recover Button to begin the recovery process. If the recovery process gets completed successfully then, the restored data will be saved in the Target directory. Apart from this, it will also create a backup log and restore the completion event in the Application event log of Windows Event Viewer. By default, the WSB backups are unencrypted. For creating the encrypted backups with the help of Windows Backup, one needs to install Bitlocker (a separate application) first. Source and destination locations are must after that, they can be enabled and prepared for the BitLocker. While restoring a single mailbox from Exchange backup in Windows Server 2012. It is a serious limitation as most of the Exchange Server comprises multiple databases. Users either needs to run a one-time backup or utilize the Task Scheduler to take a recurring backup. Exchange Server offers an option to back up a passive copy of the user database. 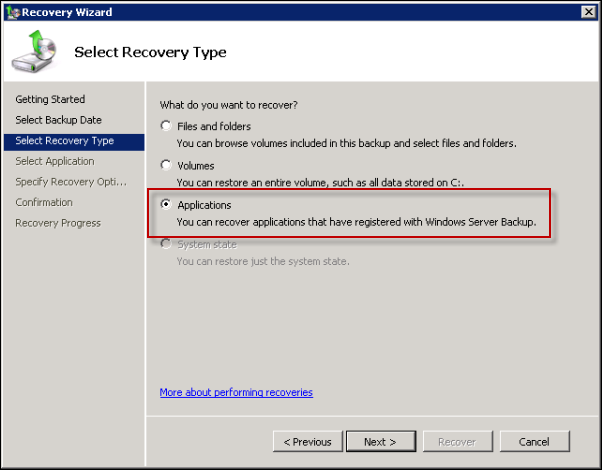 However, this feature is not available in Windows Server 2012 to take the backup. Exchange Recovery Tool is a Tested and Reliable solution of SysTools used to Recover Exchange Mailbox simply from the backup dismounted EDB files. The software allows users to recover the Exchange Server mailboxes from dismounted as well as offline EDB files quickly. Compatible with Exchange Server 2019, 2016, 2013, and all Below versions. Support Date Filter to Restore only required Mailbox from Backup. First Download Software from above Button and click Add File button to browse single or multiple Dismounted / Offline Exchange Mailbox files to recover. 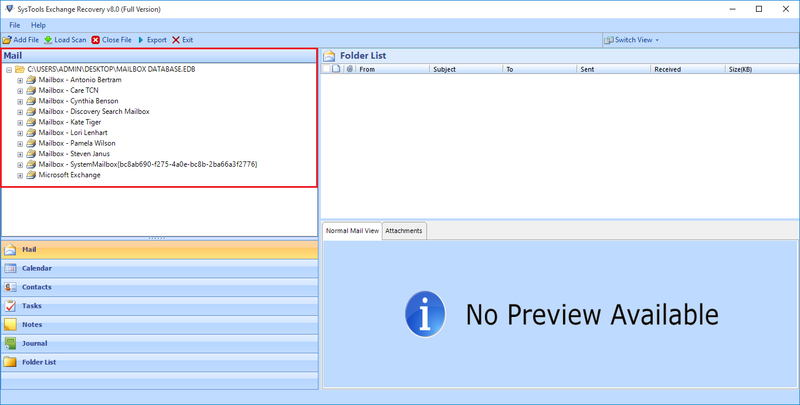 Preview Exchange Mailbox: Now view the Exchange user Mailboxes stored Backup EDB File in Hierarchy. 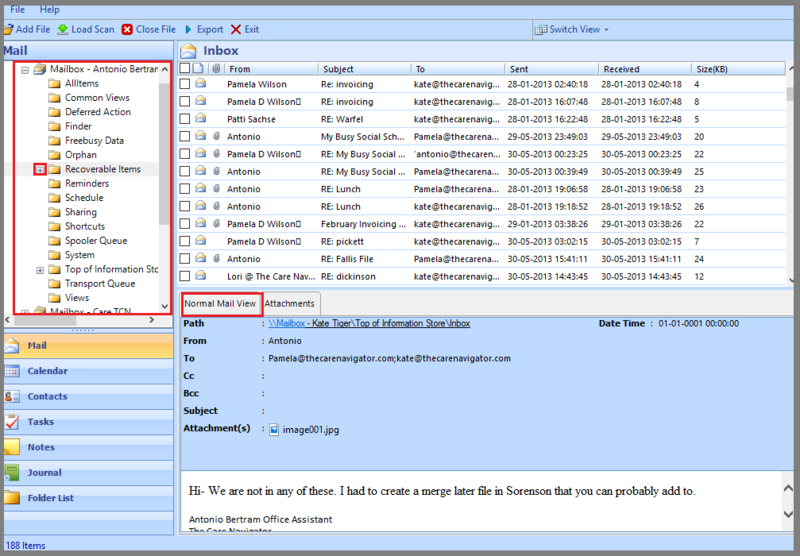 Restore Exchange Mailbox: Select the desired mailboxes and hit the Export button to move all the selected emails into Exchange environment again from backup EDB File. Select Exchange Environment: Software support various File formats. 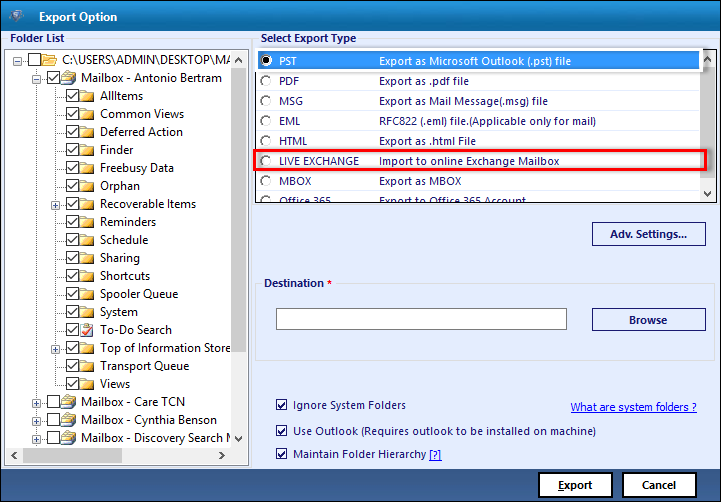 To restore mailbox from backup exchange 2010, select Live Exchange and Export option. Provide Exchange Credentials: Now provide Exchange Details to access the environment. The export process will begin now and then, the tool will display the exporting folders along with the number of data items and destination location. 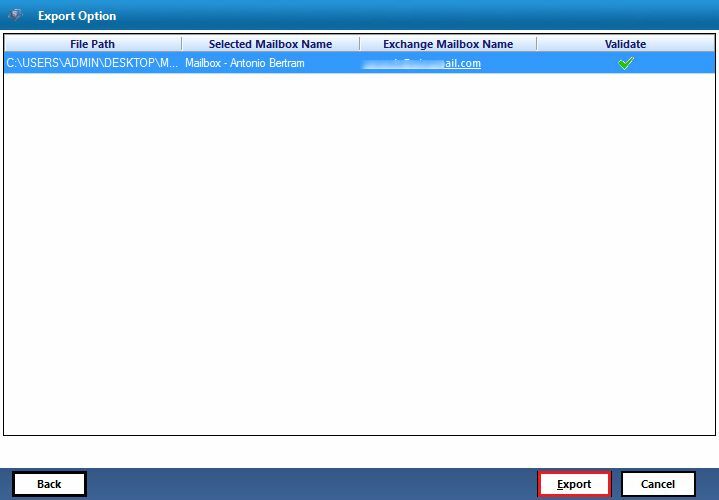 Validate Mailbox: Now provide the Desired Mailbox Details to Restore Exchange 2013 / 2010 mailbox from backup EDB File. View Mailbox: In order to verify the restoration process, access the required mailbox details and preview the resultant details. 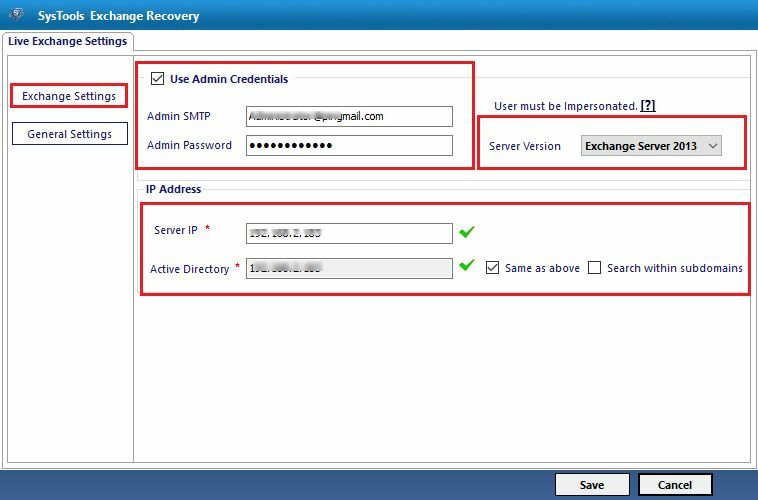 Exchange Administrator can use WSB utility to restore exchange mailbox from backup & vice versa or try automated solution offered by SysTools known as Exchange Recovery Tool used of Backup EDB File to move again into Live Exchange environment. Not only restore Exchange database but also fix any kind of corruption in the backup .edb file.